We’d love your help. Let us know what’s wrong with this preview of The Vagabond by Colette. Thirty-three years-old and recently divorced, Renée Néré has begun a new life on her own, supporting herself as a music-hall artist. Maxime, a rich and idle bachelor, intrudes on her independent existence and offers his love and the comforts of marriage. A provincial tour puts distance between them and enables Renée, in a moving series of letters and meditations, to resolve alone the struggle between her need to be loved, and her need to have a life and work of her own. To ask other readers questions about The Vagabond, please sign up. Why in the world did I like this so much? Is it the plot? It is about a music-hall dancer, Rénée Néré. She is thirty-three, a Parisian of Montmartre, a recent divorcée. She is burnt by marriage. She is determined and hardened, but honestly she is really just hurt. Hard on the surface and determined to survive. Will she choose to manage on her own or will she marry into an easy life of comfort and wealth…but what must she sacrifice then? What does she really want? We watch her path toward self-dis Why in the world did I like this so much? Is it the plot? It is about a music-hall dancer, Rénée Néré. She is thirty-three, a Parisian of Montmartre, a recent divorcée. She is burnt by marriage. She is determined and hardened, but honestly she is really just hurt. Hard on the surface and determined to survive. Will she choose to manage on her own or will she marry into an easy life of comfort and wealth…but what must she sacrifice then? What does she really want? We watch her path toward self-discovery. The book is partially autobiographical, but it was first published in 1910, while the author, Sidonie-Gabrielle Colette, died much later in 1954, so it can only be about her younger years. She was born 1873. Any peek at Wiki will tell you that the author married three times and had both scandalous lesbian and heterosexual relationships. When you read the book you don't know how she will choose. You watch, and I found it totally convincing. I think this is what I found so wonderful with the book. What was life like at the turn of the 20th Century for the music-hall dancers of Paris? This is why I chose the book, but it turned out to be much more of a look at one woman’s choices. I am convinced she made the right choice for her, and that means I got to know who she was, not just any music-hall dancer. Then there is the writing. First I found the writing florid, filled with words and phrases such as "whence" and "thou" and "his prompt docility" or "in a moment of exquisite bliss". Antiquated? Dated? I started with dislike but grew to marvel at how expertly the author depicted situations and places and emotions. By the end I thought it read as poetry. Does this also reflect the author’s passage toward becoming a writer? I usually like simple writing, and that is not what is delivered, but I certainly liked this. Another surprise. The narration of the audiobbok by Johanna Ward was f-a-n-t-a-s-t-i-c!!!! It could not have been better. Perfect French and the tone perfectly matched Rénée/Colette. The story is told in the first person narrative so we are listening to Rénée words and thoughts. She must have sounded exactly so! Maybe the audio version further enhances the believability of the story told. I don’t like short novels, but I really liked this! Both its exquisite writing and how it was so thoroughly convincing! You must know that Colette also wrote Gigi which became both a film and a stage production. This is probably the most beautiful piece of writing I've ever found. If there is a more honest exposition, a more sincere appraisal, of the narrative we live when not consumed by mundane distractions, I look forward to your recommendations. Colette's talent lies in enumerating the sensory details we barely notice and explicating the relationship between the tactile and the emotional. In an existential sense, this is a novel about nature and desire, surrender and choice. But forget the philosoph This is probably the most beautiful piece of writing I've ever found. If there is a more honest exposition, a more sincere appraisal, of the narrative we live when not consumed by mundane distractions, I look forward to your recommendations. Colette's talent lies in enumerating the sensory details we barely notice and explicating the relationship between the tactile and the emotional. In an existential sense, this is a novel about nature and desire, surrender and choice. But forget the philosophical superimposition, the existential battyfang is reductionist. The Vagabond is simultaneously primal and detached. When all is said and done, you go to ground because who you are is constructed from where you come from. And where you come from is made of smells, fabric, the ambient temperature to which you're accustomed, the color of the foliage and how it turns with the season. That said, it's impossible to capture the novel in a few sentences. It's deception, it's contrast, it's doubt, it's an assertion of will, it's protofeminism, it's submission... for starters. Long before Cher and Madonna thought they invented “first names only,” there was Colette (1873-1954). And long before gay rights, Collette, who was bisexual, flaunted her numerous lesbian affairs. Of course this was Paris, not Peoria. In addition to being an author, Colette was a stage performer – actress, mime and dancer and that time of her life informs this book. 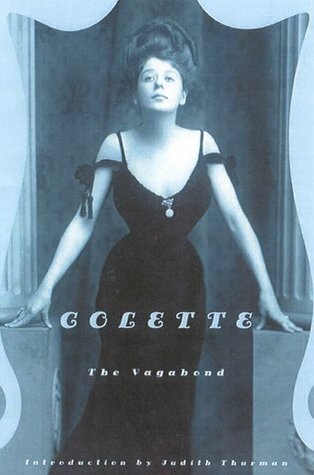 I’ve since read that the title, “The Vagabond” is in error and it really should be more properly translated as “The Wanderer.” Inte Long before Cher and Madonna thought they invented “first names only,” there was Colette (1873-1954). And long before gay rights, Collette, who was bisexual, flaunted her numerous lesbian affairs. Of course this was Paris, not Peoria. In addition to being an author, Colette was a stage performer – actress, mime and dancer and that time of her life informs this book. I’ve since read that the title, “The Vagabond” is in error and it really should be more properly translated as “The Wanderer.” Interspersed with the narrative are many exquisite passages describing flowers, trees and the seasons. Colette has quite an eye for nature, if you like flowery paragraphs (pun intended). So our main character is a 33-year old wanderer, three years since her divorce. She was married to an artist who beat her and who spent most of his time bedding other women. Still, she stayed with him for eight years. Now she is independent and really loves her work as (like Colette) an actress, mime and dancer. Now she has acquired an admirer. He’s unmarried, persistent, very well off, good-enough looking and he loves her and wants to marry her. She’s fond of him, maybe even in love with him, and she’s tempted. She goes on a 40-day show tour without him and promises to give him her answer when she returns. They exchange letters and she starts to weigh his words: “This is what I want for us…” Her earlier experience tells her this will only last a few years; this is France in the first half of the 1900’s --- all well-off men, married or not, will take a mistress after a few years of marriage. But as she tells us many times, she is 33, so she feels her clock is ticking. The blurbs tell us that Erica Jong called this book “…one of the first and best feminine novels ever written…” That’s quite an endorsement. Beautifully written but not at all what I expected. I guess that I was thinking it would be something like Gigi; instead, it is the painfully melancholy story of a woman so wounded by her failed marriage that she is struggling to suppress all emotional attachments. É diferente do que eu esperava, ao menos a descrição que vi em certos lugares torna a protagonista muito menos pudica do que de fato ela é, mas mesmo com uma impressão errada de se colocar a liberdade acima do temor que ela de fato sente, é uma boa obra à frente de seu tempo que aplaca a irritante lenda de que tudo que uma mulher de fato quer é um homem. First off, I am bias towards this book, as any reader would be who finds a character too like-minded, too closely resembling her own set of cirsumstances. That being said, once the bond is created it then becomes a personal betrayal when the internal monologue is not the one the reader would have when their self-like character confronts the world. What does any of this have to do with "The Vagabond?" Well, to be frank, the internal monologue didn't stray too far off from what I would of thought First off, I am bias towards this book, as any reader would be who finds a character too like-minded, too closely resembling her own set of cirsumstances. That being said, once the bond is created it then becomes a personal betrayal when the internal monologue is not the one the reader would have when their self-like character confronts the world. What does any of this have to do with "The Vagabond?" Well, to be frank, the internal monologue didn't stray too far off from what I would of thought in those circumstances, actually what I did think in those circumstances. Writers are often told to write what they know, Colete certainly did. Fortunately what she knew was also fascinating, and bold considering the era. Colette dit je et parle au présent, quand elle écrit Renée. Renée est artiste de music-hall pour mieux être libre, libre de son premier mari, libre amoureusement et financièrement. Mais saura-t-elle garder cette indépendance, après sa rencontre avec Maxime, un riche héritier qui s'éprend d'elle ? A travers un texte simple et direct, parfois fragile et d'autres fois travaillé, Colette parle de l'indépendance de la femme, tout en décrivant son monde de music-hall, peuplé d'acrobates aux visages fa Colette dit je et parle au présent, quand elle écrit Renée. A travers un texte simple et direct, parfois fragile et d'autres fois travaillé, Colette parle de l'indépendance de la femme, tout en décrivant son monde de music-hall, peuplé d'acrobates aux visages fardés, et bordé de froufrous. L'écriture nous emmène, sans plan et sans schéma, comme dans un journal intime, captivante et inattendue. 30 years ago, in my twenties, I read this and felt I had a serious kindred spirit. Since then I have learned French if just to read it again in it's original language. I just finished this book and I could cry from sadness and anger. I hate that Colette ended it like that. WHY??? My heart aches for both characters. This 1910 novel was written from the author's own experiences, which one can read in a short biography at the start. This information allowed me to understand the protagonist's feelings on love and the choices she made. On a personal level, I can identify with Renee on the fear of love and of losing one's own freedom and self to it. I would give thi I just finished this book and I could cry from sadness and anger. I hate that Colette ended it like that. WHY??? My heart aches for both characters. I was expecting this to be a bit like Age of Innocence, and I guess it is, thematically. But it's also feels a bit like Virginia Woolf. That's a problem because I've never been a big fan of her writing. In addition to a stream-of-consciousness style, it's also written rather colloquially with lots and lots of sentence fragments and at least half a dozen ellipses per page. Three's something off-putting about the prose. All the ellipses and sentence fragments don't quite scan in English - the sente I was expecting this to be a bit like Age of Innocence, and I guess it is, thematically. But it's also feels a bit like Virginia Woolf. That's a problem because I've never been a big fan of her writing. Three's something off-putting about the prose. All the ellipses and sentence fragments don't quite scan in English - the sentence fragments don't flow naturally in English, nor do the pauses implied by the ellipses seem to fall in a logical spot. I wonder if this is a translation issue? Perhaps these fragments and pauses that look so awkward on the page here would sound a lot smoother if read aloud in the original French. A classic feminist translation from French that’s a “romantic” story told by a heartbroken performer named Renee, who must choose between freedom and love during Victorian times. About: Published in 1910 this is a short book that is supposedly a semi-autobiography from the interesting bohemian author – Colette. The story is told in first person by Renee Nere, the main character who has divorced her wealthy, philandering, artist husband after eight years of emotional torture. Damaged, much wiser, A classic feminist translation from French that’s a “romantic” story told by a heartbroken performer named Renee, who must choose between freedom and love during Victorian times. About: Published in 1910 this is a short book that is supposedly a semi-autobiography from the interesting bohemian author – Colette. The story is told in first person by Renee Nere, the main character who has divorced her wealthy, philandering, artist husband after eight years of emotional torture. Damaged, much wiser, yet lonely, she has managed to support herself as a dancer and actor in Paris. Although not considered an acceptable profession for her social standing, it never-the-less gives Renee a sense of independence which is hard earned during a time when a woman’s independence was not common and, indeed, shunned. When a wealthy gentleman falls in love with Renee and promises her the moon, and the dancer attempts to decide between marriage and independence - that is when the reader gets a glimpse into why this book is considered a feminist classic. Thoughts: I truly enjoyed this book in audio, with its UK-English accented reader and its esoteric French phrase usage. (I speak 4 words of French and received horrible grades for it in high school, so did not understand most of it). Yet the English part of the book is descriptive and pleasant, if slightly long winded at times. At one point Renee travels the French countryside, and the letters Renee writes her would be lover are sweet indeed. When doing research about the author, I found Colette to be an intriguing subject. Living a life that was not standard, she broke many social rules including affairs with a tabooed family member and women. Although this book does not have LGBT elements, it’s still feminist in nature and is not your happily-ever-after romance. But I think that is where its value lies, in a “realistic” example of a woman who goes against the social norms of the times and lives her life to the fullest. I really like Collette's writing in this book. It has received some negative reviews for an awkward translation, but I like it. It's very evocative of the narrator's personality. Great book for getting a feel for what life as a woman in the underbelly of Paris was like in the early 20th century. Can a book save your life? I believe so. Through some foresight I stuffed this book in my hospital bag before being admitted to the Dickensian Royal Aberdeen Infirmary where I almost died of complications with asthma and influenza type A. I clung to the details of life force in the book-- while struggling to breathe and to get care in the grim institution where I was to get well. I read certain pages over and over, immersing myself in the joy of the prose. I tried to read this book as a young wo Can a book save your life? I believe so. Through some foresight I stuffed this book in my hospital bag before being admitted to the Dickensian Royal Aberdeen Infirmary where I almost died of complications with asthma and influenza type A. I clung to the details of life force in the book-- while struggling to breathe and to get care in the grim institution where I was to get well. I read certain pages over and over, immersing myself in the joy of the prose. "Tu mi volevi illuminare di quella banale aurora, poiché mi compiangevi così buia. Buia, se vuoi: come una camera vista dall'esterno. Scura, e non buia. Scura, e arredata dalla diligenza di una vigile tristezza; argentata e crepuscolare come l'upupa, come il sorcio setaceo, come l'ala della tarma. Scura, con il rosso riflesso di un ricordo straziante... Ma tu sei colui di fronte al quale non avrei più il diritto di essere triste." Well, this was NOT for me. My book club discussed this last night, but couldn't really participate in the discussion of the novel. I could barely read two pages without looking for the exits (so to speak). So I supplied biographical information I learned from reading the Judith Thurman biography of Colette. The perfect image of the Paris life in the 20s, a feminist narrative at its most sincere revelation, not necessarily ending in a self-destruction tragedy, instead, a surrender to the 'gloomy gymnastics of solitary' or to the 'horribly alone and free 'state of mind as the author writes. An attempt, a desire which reveals itself in the same form even today, six decades later. La novela es de 1910, la narradora, una dramática, el lenguaje, muchas veces rimbombante. Pero, al mismo tiempo, contiene muchos pensamientos lúcidos y una decisión muy moderna para la época. Terminé el libro con una idea en mi cabeza, amor. Sí, es una hermosa historia entre un hombre y una mujer. Pero sobretodo de amor a la libertad y a uno mismo. Maravilloso encuentro con una grande de la literatura y que me deja queriendo más. Such a fun book. A trip into the life of a small actress/mime in turn of the 20th century France. The narrator lushly describes the Parisian theater life and contemplates how to move on from a terrible marriage. The ending took me by surprise but I appreciated it a lot. I think it's a pretty feminist book--I wouldn't say that about all of Colette's writings, but definitely this one. Give it a shot! I didn't like this book quite as much as Cheri & The Last of Cheri, but I still really enjoyed it. I loved the descriptions of stage performances and theater travel and I liked the musings on the competition between romantic relationships and professional freedom. But here, I found Renée somewhat tiresome in her overall distrust of passionate feelings. I wanted more exuberance from her about her theatrical work and her professional career. I was never sure that I entirely understood the love I didn't like this book quite as much as Cheri & The Last of Cheri, but I still really enjoyed it. I loved the descriptions of stage performances and theater travel and I liked the musings on the competition between romantic relationships and professional freedom. But here, I found Renée somewhat tiresome in her overall distrust of passionate feelings. I wanted more exuberance from her about her theatrical work and her professional career. I was never sure that I entirely understood the love affair between Renée and Maxime. Was it only her own fear that made him seem controlling and jealous or was there something in his character? As with the other books by Colette that I've read, I was surprised by how fresh and modern this novel felt –– it's hard to believe that these books were published more than a hundred years ago. I liked the feminism of the book, but sometimes it was just a bit too wordy. I liked the ending and I was impressed with Renee. After reading Colette's biography, I expected her to be a staunchly independent and promiscuous woman, but Renee in the book was not that exactly. I like how she was not just one thing, she had duality and was a full person--not just a woman who was independant, but a woman was was independant but also felt things for men and had to decide what was best for her. This book was really boring. I had to convince myself to finish it since it's a required reading. I like the ultimate end of this book but the characters (especially Maxime) were very frustrating. I understand the theme and the message of the book but I was too upset to enjoy it.